So, I’m the type of mom that prides myself on looking put together. But here’s a fun fact about me: I have Anxiety. With a capital A. The kind doctors treat, not the kind you get when you have to speak in public. Another fun fact: for whatever reason, the way my body handles too much Anxiety is by going into a full panic attack mode and this results in me sweating through my clothes, puking my guts out and eliminating everything in my digestive tract. FUN, RIGHT? A couple of years ago, this was happening to me every couple of months. When I was 9 weeks pregnant it happened during a volunteering shift at the Ronald McDonald house. I became so overwhelmed I momentarily passed out and threw up all over the floor of the bathroom because I couldn’t physically lift my head to the toilet. They called an ambulance. The specialists I saw after that and various ultrasounds of my innards determined that there was nothing “wrong” with me, except that I probably have a serotonin imbalance. Which basically felt like they were saying, good news! You’re not sick, you’re crazy! So why am I telling you this now? Today I had one of these episodes at my daughter’s new school. I was there for the preschool Valentine’s party and I brought little goodie bags for the kids and a bouquet I’d arranged for the teacher. As soon as I got inside I recognized the signs of imminent doom. For some reason whenever I feel sick I automatically need to be on the floor. As I felt the waves of panic washing over me I knew I had to get to the bathroom, so I ran to the teachers’ restroom and started vomiting loudly. I didn’t even have time to close the door. I tried to put on a brave face and go into the classroom for the party. The moms were so beautiful and so put together and I really wish I would have met even just a single one of them before because I would have collapsed into any of their arms for a hug and a cry at that moment. I had to leave the room again when I felt another wave of nausea and that time I didn’t get off the bathroom floor, where I was discovered by the school secretary. I awkwardly tried to explain my condition to this lovely, horrified woman who was putting on a tight smile and clearly, for my benefit, pretending that this situation was totally normal. I don’t know how many people have this problem, but I do know what it feels like to try to explain to someone why you are violently ill, but not really “sick.” It’s awkward for both of us if you’ve never experienced it. 1. I’m not reacting to anything specific, I’m having a reaction based on the chemicals in my brain going haywire. My brain makes my body physically sick and even when my brain feels better, my body takes time to catch up. From the time I realize it’s going to happen to the time I’m ill is approximately 5 minutes but it feels like 25 minutes of choking. 2. I’m not pregnant, so your awkward jokes about that being the reason I’m vomiting are not appreciated. 3. A cold bathroom floor is the only place that doesn’t make me feel trapped and restless. I don’t want to move. I would not be more comfortable anywhere else so don’t try to get me to move. 4. I don’t have the flu. 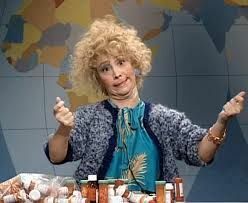 I have lots of different prescriptions in an attempt to eliminate these attacks: anti-anxiety, anti-nausea, anti-spasm, anti-depressants…my purse looks like it belongs to Collette Reardon from SNL. Usually they work, but once in a while my body overrides them. 5. I can see how crazy I look by the expression on your face. I’m so sorry for scaring you. I’m scared too. I’m going to be okay, just not at this moment. If this happens to you, I want you to know you’re not alone. Anxiety: I get it. ← She’ll be here all week, folks. Hey girl! Glad you wrote this one. I have been having extremely similar attacks for a few years now, and have only recently found that they were actually panic attacks. All of sudden a wave of nausea hits and I attempt to run to a restroom (unless I’m on a plane and then I panic even more, cry, and grab the sick bag from the back of the seat). I generally just dry heave and then lay on the floor in a literal puddle of sweat. You are so spot on when you say that a cold restroom floor is the only place I want to be when this happens. It feels like an hour but usually only lasts 5-10 minutes. It took me forever to figure them out since they never happen when I actually feel stressed out or upset. It is comforting to know that I am not the only one that goes through this. Thank you for sharing! Emily, Cousin, I have so much to say I don’t even know where to begin!! One, I am so proud of you for writing about this. You have done something here I have longed to do for years, but my shame about the anxiety & panic & “crazy” caused me to hold back. I do want to say that I am finding more & more anxiety & panic in our family line, & tho you are cousin by “marriage” it runs through so many families. 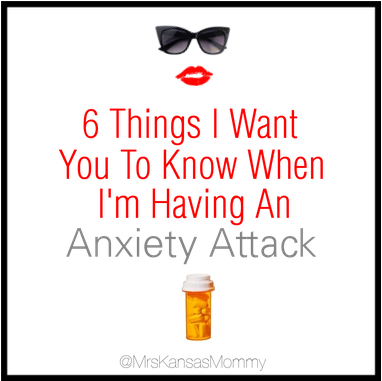 I am oddly relieved to hear how you have your anxiety attacks because Madison, my youngest does exactly the same thing. She HAS to lay on a cold bathroom floor, preferably the one by mommy, and she dry heaves, or pukes or wishes she could. I have extreme panic & agoraphobia, lots of social anxiety etc. I wish I threw up, tho I know it is hard on you, I do NOT mean to take away from that! But for me, mine goes to disassociating. I feel like nothing is safe, I am going crazy, Losing my mind, can not get help because there is no one who can help me( Russell & two of my 5 kids get it & can help, but they can’t stop it from happening when it happens) Heather helps quite often, she gets it, and I have another friend who also really gets it. But tho I am lucky, the few people who do “get it” makes the world pretty small because I do not want to panic alone in public, so enter agoraphobia. What if I have a panic ATTACK in public and my hair & skin turn green, & I scream obscenities & run around in a crazy out of control circle or throw myself into traffic. What if I lose my mind & they take me away & lock me up (you may know where I get that fear from). So I stay close to home, & keep to myself WAY to much & my world got so small…Don’t let your world get small, don’t be ashamed of who you are and how god made you. Heather always tells me, when I feel so discouraged about all of my allergies that also limit my movements, because perfumes, colognes, smelly laundry detergents, bug sprays in buildings, scentsy’s, you name it I am allergic to it! She tells me I am the canary in the coal mine. That we have that sensitive spirit, attuned & affected by our environment, but that we are teachers. You are a teacher with this as well. My allergies can set off a “reaction” and that reaction causes me to want to flee, take flight, but if I “should” or “ought” to stay there, then I feel trapped, embarrassed, alone, & I panic, and then I usually leave anyway…with all the awful feelings, shaking, trembling, terrified, confused, choking for air, ashamed & really really sad. I love the idea of T-shirts. I think we are a society riddled with emotional pain & isolation, and building community, communication & supportive spaces is just a good way to be in the world. Bravo for this writing. I am so glad to have read it, thank you for sharing & for letting me share here as well! J, I don’t know how I initially missed this comment, but I just read it and YOU GET IT! It IS embarrassing at first and the sooner we all say what really goes on behind closed doors (minds) the sooner we can all laugh about it. Because, as you know in our family, “if we didn’t laugh we would all go insane!” So much love to you! Jen, I am so sorry that I am JUST now replying to this and I didn’t see it sooner! So I, too, have seen a therapist and have several prescriptions which help tremendously. The “too much caffeine” thing totally resonates with me. When I was a little girl I would say I just feel “yellow.” (Where are my royalties, Coldplay??) I don’t know why, but it was the word that described that weird feeling in my stomach. Brand New has a song out you should listen to called “I Am A Nightmare” in which the lyrics say, “I want to find a way. I want to throw up snakes…” which, to me, is the perfect description of anxiety. Thanks for sharing your situation; I don’t take it lightly or take it for granted.